Today we had a very enjoyable time making bookmarks under the expert guidance of Gail. She demonstrated bookmarks made with a choice of beautifully coloured felt/ribbon, characterful animal corner bookmarks and geisha ladies complete with patterned kimonos & costume accessories. 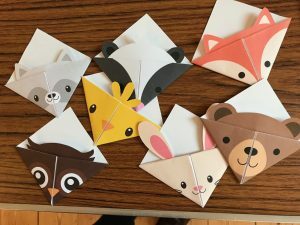 As well as careful cutting & folding, there was also a surprising amount of measuring involved so that our mathematical skills were tested too! Caroline brought along a delicious orange-chocolate panettone cake which complemented the tea and coffee when we arrived. 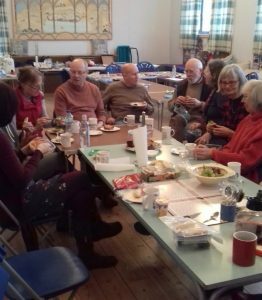 We were joined by Mark, James and Robin who had already been working in the church garden and ready for a welcome break. Lunch gave us time to relax and chat before continuing the bookmark production. It was fun trying different colour combinations and sometimes managing to perfect our skills second time round! 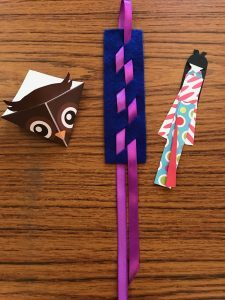 We were very pleased with our creations and there was appreciation for all the work Gail had done in preparation for this Dorcas bookmark activity.